William A Straub, opened his first grocery in Webster Groves back in 1901. His goal was simple, to provide the best in quality products along with exceptional customer service. Popsie, as he was called, would leave the store in the morning going door to door throughout Webster collecting orders. After filling the orders back at the store, he would deliver each order in the afternoon. All of this was done with his horse and buggy. A relocated and slightly larger Webster store opened a block away in 1926. Popsie and his two sons, Walter and Jack, continued to grow the business by expanding into Clayton, Brentwood, Richmond Heights and the Central West End throughout the 40’s and 50’s. Their focus continued to be slow but intentional growth. To ensure the quality of their products they produced many of them including ice cream, candy and baked goods in their own production plant. The current Clayton location, along with our corporate offices on the second floor, opened in 1948 with the current Central West End store taking over an existing grocery store and opening just one month later. A brand new and expanded Webster store opened in 1962 and our last current store opened in Town & Country in 1966. 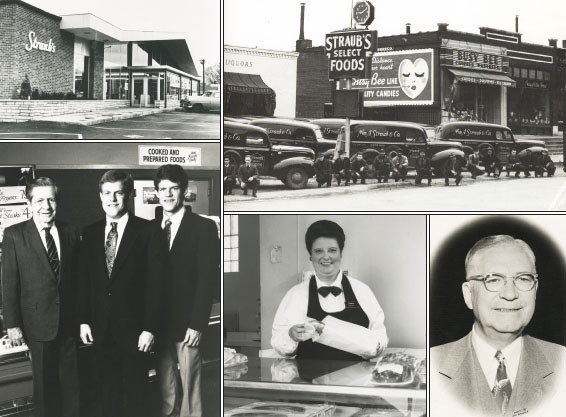 Today, Straub’s continues to be a family operated company led by the third and fourth generations, Jack W Straub, Jr and his son, Jack W (Trip) Straub, III. Straub’s, through our 4 retail locations and online market straubs.com, is known as an outstanding specialty food retailer giving great service to our staff, customers, vendors and community.